Line two baking sheets with waxed paper; grease the paper and set aside. In a large heavy saucepan, combine the caramels and water; cook and stir over low heat until smooth. Stir in pecans and cereal until coated. Drop by teaspoonfuls onto prepared pans. Refrigerate for 10 minutes or until firm. Meanwhile, in a microwave, melt chocolate chips and shortening; stir until smooth. 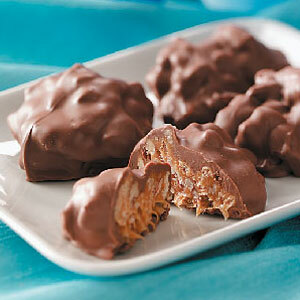 Dip candy into chocolate, coating all sides; allow excess to drip off. Place on prepared pans. Refrigerate until set. Store in an airtight container. Yield: about 2 pounds. 1 ounce equals 172 calories, 10 g fat (4 g saturated fat), 4 mg cholesterol, 51 mg sodium, 20 g carbohydrate, 1 g fiber, 2 g protein.